Hainan authorities have vigorously reinforced the province’s tourism trade over the past five years, according to a report delivered by Governor Jiang Dingzhi at an annual session of the provincial people’s congress on Jan 27. Tourism is crucial to the province’s economic growth, Jiang said. 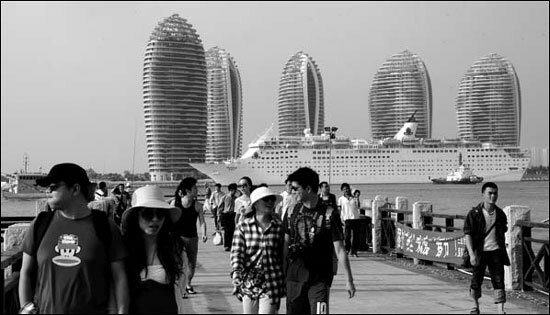 "The provincial government established two new (highest level) 5A scenic spots, approved 33 five-star hotels in five years and developed five yacht harbors built in line with international standards," Jiang noted. "A series of large tourism projects are now under construction and will be completed on schedule," he continued. "Ecological tourism products as well as special routes featuring forests, culture and shopping will also be developed this year to make the province deserve the title of an international tourist island." In 2012, the province received more than 33.2 million people who stayed for at least one night as tourist revenue totaled nearly 38 billion yuan ($6.1 billion), double the number in 2007. While the province has burgeoning service industries, farming continues to be a mainstay of economic growth. The added value of agriculture has grown at an average annual rate of 6.7 percent over the past five years, ranking first across the nation, Jiang said. The province has contributed half of the country’s rubber yield, with a total output up to 400,000 tons. It has also created many superlatives – the nation’s first animal epidemic-free area, the largest export volume of tilapia fish from China and the largest deep-sea seafood feeding effort in Asia. The provincial government has reinforced 519 reservoirs and built about 12,000 kilometers of leak-resistant canals. In addition, it has also increased efforts to improve the livelihoods of rural residents. It has opened up more than 9,000 mu (600 hectares) of new farmland, built over 15,000 kilometers of roads, offered clean drinking water to almost 1.67 million people, and invested more than 5.2 billion yuan to upgrade the power grid in rural areas. About 210,000 people have risen out of poverty while 348,000 residents have benefited from the new poverty alleviation initiatives. The provincial government also has attached more importance to scientific innovation and technologies to save energy and reduce emissions, Jiang noted. It has spent 4 billion yuan in technological research and development, accounting for 0.49 percent of the province’s GDP, more than double the previous 0.23 percent. Some 3,500 inventions have been granted patents in the province, and 61 modern laboratories have been built along with national and provincial technical centers. Emerging industries including petrochemicals, new building materials, electric information and marine-related businesses are also becoming strong forces in boosting the local economy, said the governor.